I’ve watched that many food experts, even the ones I admire, suggest loads of elaborate lunchbox ideas. Here’s what I’ve learned after 11 years of parenting so far. The kids want to play. Most kids will not sit and eat a sandwich, a tub of yoghurt, a piece of fruit and lots of vege sticks all in one sitting. And there’s no chance while the playground is begging for their attention! I’d say my children are ‘pretty good’ eaters. They have definitely been known to be described as ‘having a good appetite’, put it that way. But when the lunchboxes started to come back a little too full for my liking (because I hate waste and of course I want them to eat well), I changed my approach. I put less food in their lunchbox! Hear me out. I rarely put processed food into my kids’ lunchboxes. Sometimes I’ll put a homemade treat but that’s usually it. It’s not because my kids are not allowed to have treats. They are. But popping treats into a box filled with nutritious food that you are expecting them to eat in a very short period of time before they want to play is not going to work. They will ALWAYS go for the treat and leave behind the healthy food. I also don’t overfill their lunchboxes anymore. It’s too overwhelming for my primary-aged kids. I keep it healthy, simple (go the leftovers!) and small portions. I’ve worked out what’s ‘just enough’ for them. I try to keep it easy for them to eat. I don’t overfill wraps so that my 6 year old in particular can get her little mouth around the food! I chop up fruit or pre-peel the mandarins (at home they have to do this themselves). I put a lot of goodness into breakfasts and dinners. If you have seen my Facebook pages https://www.facebook.com/fitbusymum/ and https://www.facebook.com/marcheserosemary you’ll know by now that my kids eat well before they leave the house. I’ve had many a mum say to me ‘I don’t have time for that in the morning’ but trust me putting in the time is worth it. We can have a hearty and healthy breakfast ready for the kids in just about no time with a little bit of meal prep or some really simple ideas. This makes sure that the kids leave for school with a satisfied tummy so they are not starving by morning tea. Sit down to dinner as a family as many nights per week as possible. This way you are encouraging good eating habits while you can be around. 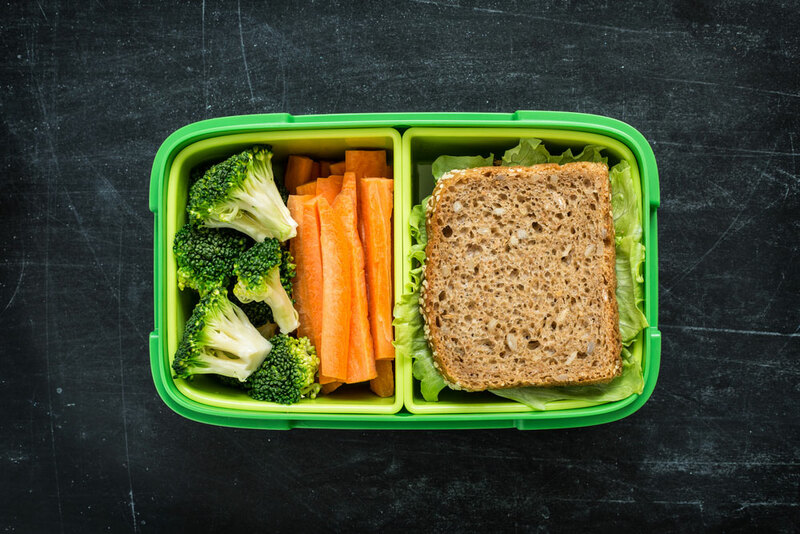 You can’t be there at school and it’s a tough enough gig for teachers without the pressure of getting kids to eat EVERYTHING in their lunchbox. Chicken schnitzel strips with chopped vegetables. Slice leftover chicken schnitzel into strips and put in lunchbox with some chopped veges. This is a great alternative to a sandwich. My kids love it! Rice paper rolls only need a quick soak in water to be ready for use. So versatile! Fill them with only a few items to keep them from breaking. Ham, alfalfa sprouts and grated carrot is a perfectly simple and yummy combination. Leftover rissoles from the night before are another easy finger food for kids. Mix together some mince, 2-3 eggs, bread crumbs, chopped onion, chopped parsley and combine to form balls and cook. Sometimes I add in some grated veges, perhaps zucchini. Serve in lunchbox with some sliced cucumber or celery. There’s nothing wrong with going back to basics. Sometimes a hard boiled egg is a great little addition to a lunchbox. It’s seriously packed with so much goodness, including protein, keeping the kids pretty satisfied. Leftover roast meat, combined with some nicely baked sweet potato and perhaps a little lettuce is one of my kids favourite combinations in a wrap. The tastes are all there from the night before and the ‘orange chips’ give it a little sweetness. Like I said before, I don’t overfill it so it’s easy for their little mouths and hands to manage it all. I love using roast chicken for a leftover chicken and lettuce sandwich. I even use the carrot and broccoli as a little side. So easy!